The AVRX2500H features the latest video technologies from Dolby Atmos and DTS:X. On all the ports; 4K Ultra HD, Dolby Vision, HDR10 and HLG and 8 additional HDMI inputs and 2 outputs bringing 2.2 support. Along with Music Platform compatibility with streaming Spotify, Amazon Music, Deezer, Tidal and more with HEOS built-in. Thanks to the features of Amazon Alexa voice compatibility, and music playback options, you have seamless control over your devices. Optimising room acoustics with Audyssey MultEQ XT and an included mic and stand. With the use of Dolby Atmos, using ceiling and upwards firing speakers, you can create an immersive sound to make you feel like you are in your personal home cinema. DTS:X makes you closer to the action, creating a lifelike experience in the home, and pushes further to give you a breathe-taking experience like you’re in the cinema. Think using ceiling and upwards speakers is a bit too much, then the DTS Virtual X might just give you a good impression. With the processor rendering images in three dimensions then it does more than a match for what normal conventional processing can do. 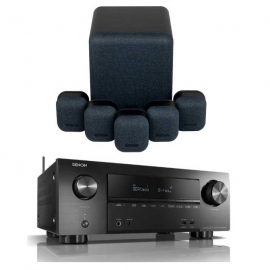 With the AVRX2500H enjoys a significant boost over the smaller Denon models. With a boost in power of 95 watts per channel or 8 ohms. If you have less efficient speakers, then you are bound to see an improvement as it is a better choice for when you use larger rooms. With the AVRX2500H been a choice for music lovers, it sounds precise and life-like. The Support that the AVRX2500H gives is a wide range of formats that take use of the HDMI. The use of UHD Blu-ray discs and Ultra HD streaming video. The eight available HDMI inputs and two outputs support BT.2020, HDR10 and HLG pass-through technology. This HDMI allows 4K to pass-through allowing for no hassle switching and viewing without needing for the receiver to be turned on. Once the setup for the speaker system, provided by HEOS the in-built app. You are able to stream music effortlessly through Spotify, Amazon Music and more streaming platforms. HEOS in-built system connects all the networks together through the use of Wi-Fi making it simple to setup a home network. Up to 32 units can be setup at one time, ensuring that even the largest of homes can be covered for music. With four audio inputs plus a dedicated MM phono input, this AVRX2500H can be at a centre of a hi-fi system. When it comes to video, the use of the two HDMI outputs are ideal for running a TV or a projector, along with the USB input at the front, you can connect any media device and playback digital files. If you don’t require the use of the Atmos or 7-channel output, you can assign speaker outputs to them, giving the use for perfect quality. With having dual antenna transceiver system for robust streaming even in congested environments, listening to your favourite audio content you can stream it wirelessly from smart devices or streaming connectivity. The AVRX2500H uses IP control capability for an integration with major third parties. And Control4 SDDP (Simple Device Detection Protocol) this is so that third party programs or devices are able to integrate with the Control4 automatic equipment. For direct connection to the external device and controlled equipment. This allows all devices to be able to be used with the AVRX2500H. With the use of the Audyssey MultEQ XT32, the AXRX6500H adapts to the room environment and matches the sound and acoustics based on the location. The XT32 does automatic measuring and sets-up device features including Audyssey Dynamic Volume, Dynamic EQ and LFC and SubEQ HT for total control. Designed to deliver full-scale audio fidelity from compact, stylish speakers and a discreet subwoofer, MASS 5.1 Gen 2 Speakers combines all Monitor Audio’s award-winning expertise with sophisticated looks. The result is a new level of performance for music, gaming and movie sound alike. MASS 5.1 is quick and easy to set up and delivers genuinely enthralling surround sound excitement in a compact design, making any room feel like a state-of-the-art concert hall or cinema. Music lovers, movie fans and gamers will all revel MASS’s ability to put them in the middle of the action, bringing incredible levels of immersion to their favourite songs, films and games. All the clarity, all the drama, all the 360-degree thrills - and a new acoustic experience - are there to be enjoyed. Hollywood knows its soundtracks are just as big a part of the cinema experience as its pictures – and, thanks to MASS, you can enjoy your own full-on home cinema surround sound experience without breaking the bank or compromising the look of your room. Despite its size, MASS is capable of dynamic, room-filling sound with all the punch and drive the biggest Hollywood blockbusters demand. With perfect clarity to build the tension in quieter scenes, hair-raising attack when the going gets explosive, and incredible effects placement to keep you at the heart of the story, MASS brings you the authentic cinema experience. If you want to properly immerse yourself in your gaming experience, there’s no better way than MASS to put you right in the thick of the action. Gaming is hugely enhanced by accurate placement of effects, seamless panning right around the 360-degree soundfield and, thanks to the Subwoofer, incredible low-frequency presence. No matter if your favourite games rely on the roar of the crowd, the rattle of the guns or the tension-packed near-silence of a spooky alien planet, MASS gives you more of what you need. Enjoy every gaming scenario like never before and take your experience to an entirely different level. Whether you like to listen in stereo or prefer a multi-channel mix, MASS has the talent to bring your favourite music to life. Thanks to the beautifully engineered integration between the Satellites and the Subwoofer, MASS is a thrilling listen from the deepest bass notes to the crispest treble. Incredible stereo imaging puts your favourite singer on the centre of the stage, while the combination of MMP II driver technology and soft dome tweeter in each Satellite gives each instrument extraordinarily faithful and convincing tonality. Fast, controlled and, above all, deep bass from the Subwoofer makes MASS as powerful and punchy a listen as it is subtle and detailed. It’s the speaker system your music has been waiting for.